Policy and Politics was delighted to sponsor a panel session on Innovative governance and the governance of change at the Third International Conference on Public Policy (Singapore, 28-30 June 2017). The panel was organised by Dr Lain Dare, Dr Paul Fawcett and Professor Diane Stone, all based at the Institute of Governance and Policy Analysis, University of Canberra. Paul is on the Policy and Politics Advisory board, and Diane is Consultant Editor. The eleven papers, spread over three panels, explored themes such as ‘fast’ and ‘slow’ policy, time and policy, multi-level policymaking, informal governance, political metagovernance, and transformative governance. Many papers also spoke about the challenges presented by rapid social and economic change, technological innovation and transboundary policy problems. 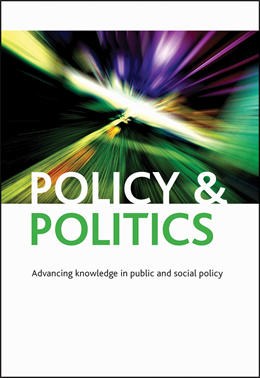 As such, all of the papers engaged with the journal’s hallmarks of relating the micro to the meso and macro (and vice versa) by addressing the link between polity, policy and politics. Welsh Government is phasing out its (former flagship) Communities First tackling poverty programme from 2017/18. The Bevan Foundation, a think tank, has stressed that subsequent local action should be led by ‘community anchors’ – community-based organisations with a good track-record and strong community engagement. In a recent article published in Policy & Politics, we use the conceptual framework of hybridity – conducted as part of the Transgob project in Cardiff, Wales – to support this recommendation, and highlight the need for local government to relinquish its former levels of control to give these organisations space to develop approaches which work for their communities. The research explored what austerity means for participation in city governance. The optimistic view is that making governance more participatory can help overcome the hurdles of bureaucracy, with government ceding control to enable capacity to address complex problems. The pessimistic view is that city governance remains dominated by state elites, with third sector and community partners co-opted to compensate for the decline in state provision, compromising their ability to advocate for and ensure that communities get decent services. In Cardiff we uncovered attitudes and practices somewhere in between these two views. We found that austerity had accelerated the city council’s use of its city governance structure, the Cardiff Partnership, to share the risk and responsibility of service delivery with other public organisations, but also with third sector organisations and neighbourhood-level community groups. Communities were certainly having to take more responsibility for delivering their own (formerly public) services, such as play and youth services and the maintenance of parks, sports grounds and streets. Those at the neighbourhood frontline faced tensions and power conflicts in trying to develop workable practice. But we did find that community-based organisations had some room for manoeuvre in developing forms of co-production that were rooted in communities as well as responding to the strictures of funding cuts. One example was timebanking, championed by a deprived community-based organisation in south Cardiff. The approach means that volunteers can exchange equivalent hours of providing a service such as kids’ school holiday activities for other services. The scheme was underpinned by the council offering access to facilities such as swimming pools, but the opportunities to spend credits earned within the community were expanding, indicating potential for it to become self-sustaining (and thus definitively community-led). But it was too early in our research to tell whether attempts to replicate it will be successful. Credit: photograph taken by Madeleine Pill of the mural celebrating ‘Timeplace’, a community timebank running in the Cardiff neighbourhoods of Ely, Caerau, Fairwater and Pentrebane. Timeplace is run by ACE (Action in Caerau & Ely) http://www.aceplace.org/timeplace/, a community-based organisation, in partnership with Spice,http://www.justaddspice.org/, a specialist timebanking non-profit organisation. The city council was also seeking to transfer assets such as libraries and community centres to communities. The frustrations of this process – such as the need for willing community groups to become formalised organisations – showed the need for change in the council’s attitudes to risk. In the words of a Welsh Government officer, government needs to ‘recognise that the cheapest and best way to achieve real things is to spot what people are doing for themselves and support them’. When the Communities First programme was reshaped in 2011, Cardiff Council innovated by contracting community-based organisations to manage the four deprived neighbourhood ‘clusters’ eligible for programme support. In so doing, the council downloaded risk and offloaded staff costs as the organisations took on responsibility for finance, HR and evaluation – thus becoming hybrid third-public sector organisations. Their staff had to navigate the tensions and dilemmas of implementing a (national) programme, engaging in the (city-wide) strategy overseen by the Cardiff Partnership, and the needs and demands of their communities. Doing this aligned with the demands of austerity, enrolling these community organisations into service delivery in ways that included voluntarism, thus increasing community self-reliance. But we also found, to an extent, that community organisation staff were able to innovate (such as with timebanking) – and in ways that maintained their community-focused mission. Therefore our Cardiff research shows how the ‘devolution, decentralisation and downloading’ of Peck’s (2012) ‘austerity urbanism’ encourages hybridity at a scalar, organisational and individual level. But our research also reinforces the need to understand local practices to provide insight beyond the dualism of empowerment or incorporation. The Cardiff experience of participatory governance demonstrates the potential for transformative alternatives in the everyday and the small-scale – and also highlights the need for state supports rather than constraints in these processes. In the case of Wales, the need to sustain the work of community anchors should be a priority. The ‘Transgob’ project analysed the discourse and practice of participatory urban governance under austerity in two British (Cardiff and Leicester) and four Spanish cities. It was funded by the Spanish government’s National Research and Development Plan (reference CSO2012-32817). Dr Madeleine Pill is a Lecturer in Public Policy at the University of Sydney, Australia, and Valeria Guarneros-Meza is a Senior Lecturer in Public Policy, based at De Montfort University, in the UK. If you enjoyed this blog post you may also like to read Community asset transfer in Northern Ireland by Brendan Murtagh. Policy & Politics Co-editor Felicity Matthews reflects on the first months of Theresa May’s new Conservative government.